I bought this dress in a Fashion Week induced panic last week, but decided to keep the dress even though I decided not to wear it! The shape is so flattering and feels really lovely quality! Its a bit too summer-y for the unpredictable weather at the moment so I'm going to save it to wear in a few months. I cant wait to wear it with brogues and no tights! 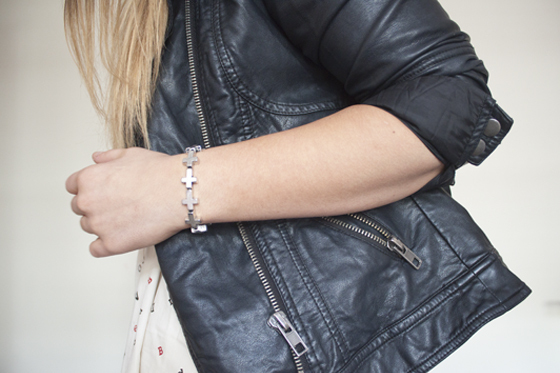 I'd probably pair it with the leather jacket still for the whole girly/tough look that I like to do! The alphabet print is really fun and different, I particularly like the shirt version of the print, which may have to enter my wardrobe sooner rather than later! Also I thought I'd mention that I wear Primark 20 denier tights most of the time. So when I'm wearing sheer tights its probably going to be them. I buy them as they are cheap and cheerful, they don't really last too long though. I generally get a few washes out of them before throwing them away. However they are 5 for £2 (or something like that!) so I don't mind too much about them being a disposable! When I wear more opaque ones I tend to wear the Primark Super Cosy tights or the 200 denier ones. Where does everyone gets theirs from? Today I spent most of the day with my family and photographing stuff for ETCLLYMLRS. I went on a little Boots spree and I couldn't wait to get using them! I'm going back to London tomorrow and then I'm going out in the evening. Really looking forward to getting back to London! WOW that dress is totally awesome!! Love your glasses and bracelet! 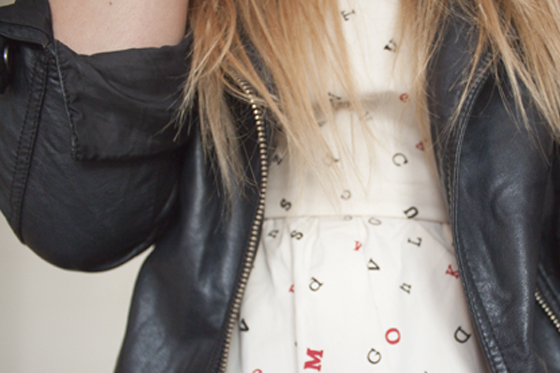 I love this with the leather jacket! love that bracelet, going to track it down now! Great dress & hat... love the look. Visit the shiny brand new blog http://www.offdutychic.com & follow me to be the first to know when I publish my next post which will be a new look. This is the cutest dress ever!! Ah I've had this dress in my saved bag for ages, as a literature student it's seemingly the perfect addition to my wardrobe. Just lacking in funds. Looks hot on you, totally regretting not going into the overdraft for it now. Great combination. So cool! 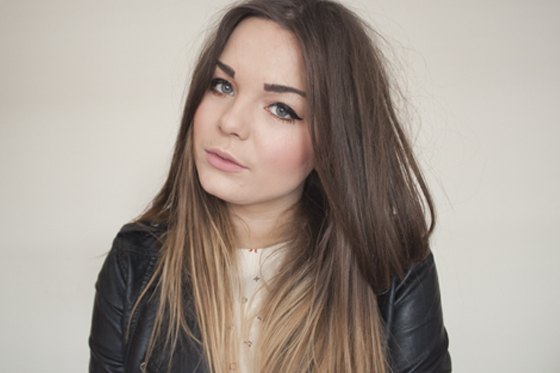 I love your leather jacket! Aww, your dress is so cute! i love the dress and hat! your so pretty love the dress! i get all my tights from newlook... the 120 den are my go to staple tights :) i find they last longer than primark ones and are still cheap too! 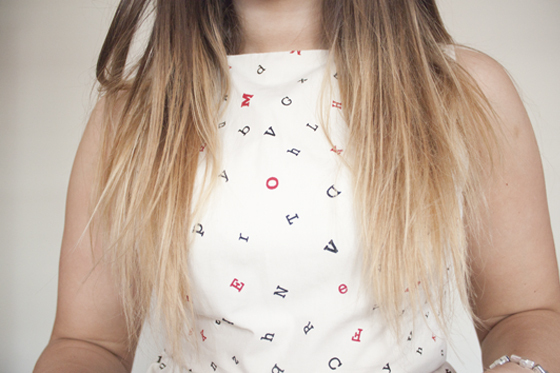 This dress is really different, alphabet print is cool! I get the cosy wool tights from primark and the more thinner ones from Markies! Such a cute dress, you look amazing! Omg the print on your dress is amazing!! I find Primark tights are actually the best I've found, although I think I wear a slightly thicker dernier. They're nice and shiny and actually pretty durable. For the price I don't think you can go wrong! I tried Boots' tights once and they were horrendous and about £5 for 2 pairs. I think they lasted for one wear. Really love this look! Would fit with the heat that London's been having lately! The hat finishes off the look well too! oh my lily that dress, so unique. you are right about the shirt being awesome too. want!! 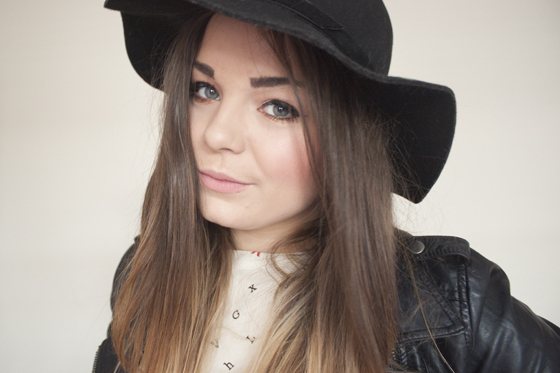 This is probs my favourite outfit of yours from the last few weeks - the dress is too cute! And I have always wondered where you get your sheer tights from actually! Generally I get tights from primark or peacocks, but as I walked past my local one today and it had shut down I guess it'll be primark, youre right about them not lasting that long, I either get a run in them, or they start to lose their 'tightness' (haha) and get saggy knees or the awful saggy crotch! :/ But an air hostess friend always wears big knickers over her tights to stop that from happening! fABULOUS DRESS, YOUR FELLOW FASHIONISTA! So much love for this dress, such an unusual print and flattering cut! Perfect toughened up with the jacket. I wear Primark super cosys too, or M&S which are pretty good value! LOVE the dress! The whole outfit looks really good! x. That dress is the sweetest! You look lovely. I like your glasses! They're quite flattering on you. I'm also dying for a pair of flatforms now. I get all my tights from either Primark (super cosy and all their funky patterned and stuff ones) or Tesco's because their 120 tights are pretty good! This post made me think of summer. SUCH a cute dress. I literally get all my tights from New Look. The dress is so cute and playful! :) I get all my tights from Macy's usually (a department store here), they're by Hue. A bit more expensive than most tights (usually 2 for $20) but they hold up really well and are the most comfortable tights I've ever worn! I love the hat on you! You look lovely! And I get my tights from Primark too but I usually get the 40 denier ones. I love this look ! Your dress is reaaly cute. the print is adorable! the fit is so nice and it looks super comfy! great find and def good call on keeping it ! Ugh, you always make me wanna buy pretty much everything you wear! Can I have your wardrobe, yes? :p that dress reminds me of going to the optomitrist! trust asos to sell something so quirky though! I've been getting lots of Peacocks tights recently, their 80 denier ones last really well, are are still very cheap! That's a really cute dress . It really reminds me of your 'older' styles that you used to have !